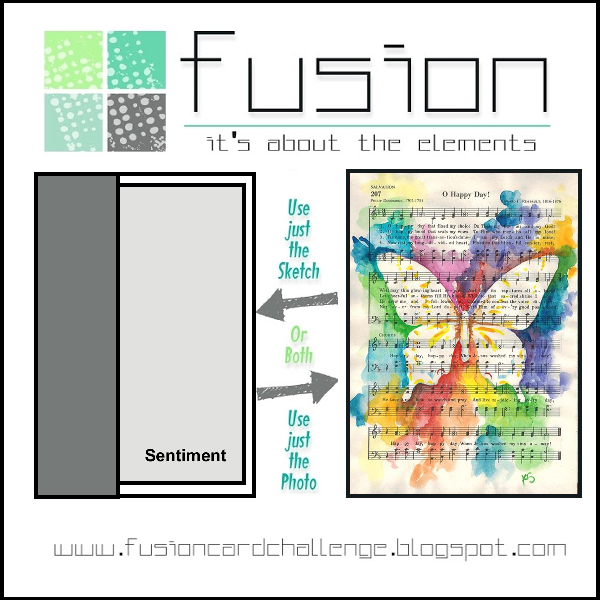 I created a fusion this time, using the sketch and the rainbow and butterfly elements of the photo. This is my first attempt. However, I thought the black was too harsh against the ink-blended panel, so back to the drawing board I went and came up with a softer version. 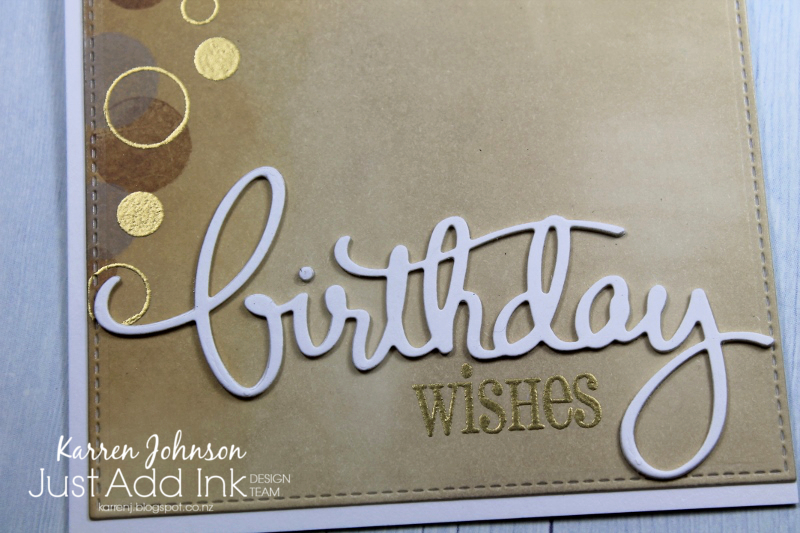 Same card, different scalloped border. This, believe it or not, is a piece of patterned paper from a Halloween paper pack. 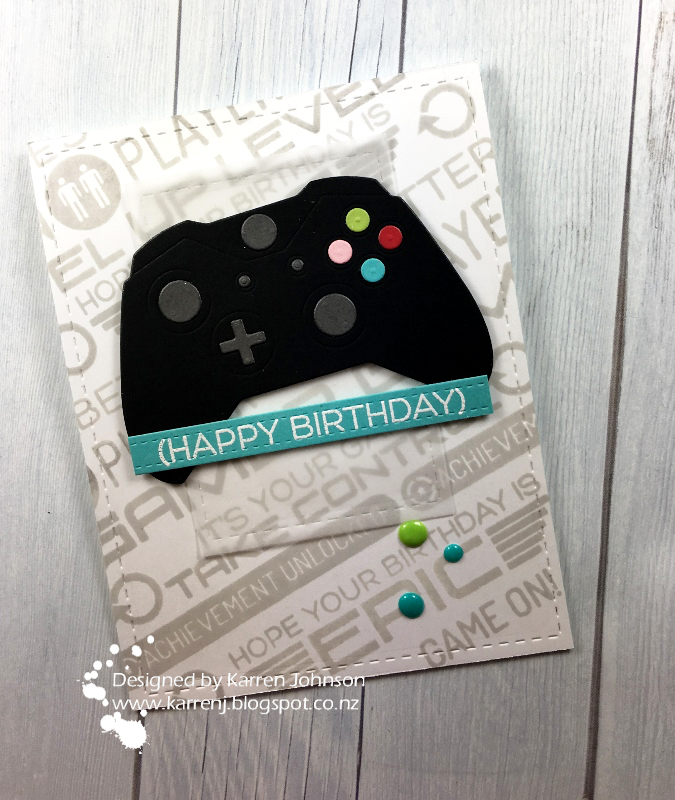 I think the grey stripes work better with the rest of the card. 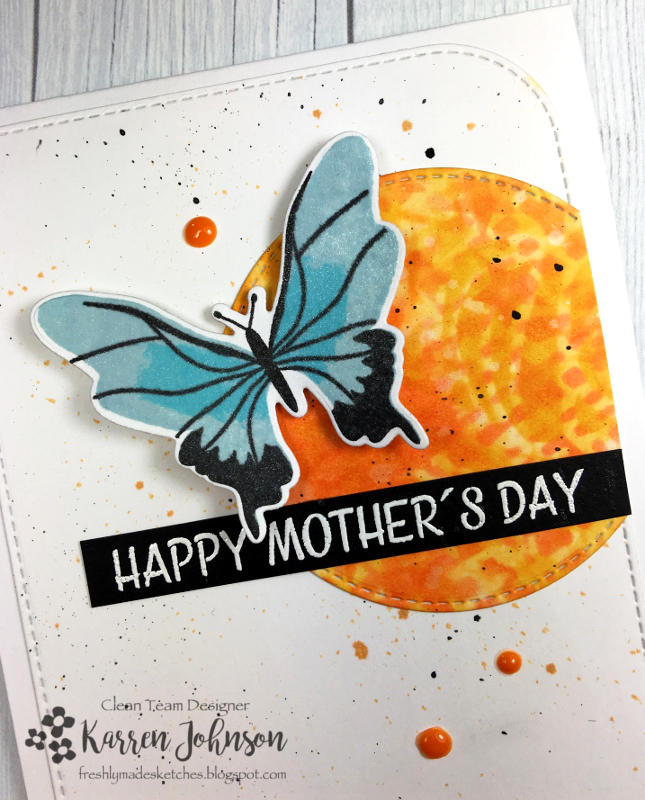 For the rest of the card, I white embossed the butterfly onto a panel of Bristol Smooth cardstock, then blended on some distress inks before flicking on some water. Once the panel was dry, I stamped the sentiment. Thanks for visiting! The rest of the DT have some gorgeous cards and I hope you'll join in too. I'm linking this up to the Anything Goes challenge at Simon Says Stamp as well as the I Wish I Could Fly challenge at Sweet Stampin'. Hi and welcome! 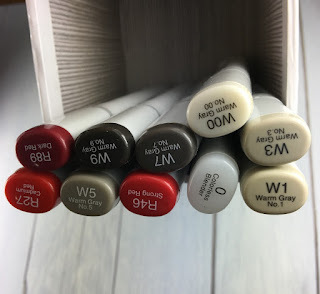 This post is late because I completely forgot to write it up last night! Having a day off in the middle of the week has thrown me. Right, on to business. 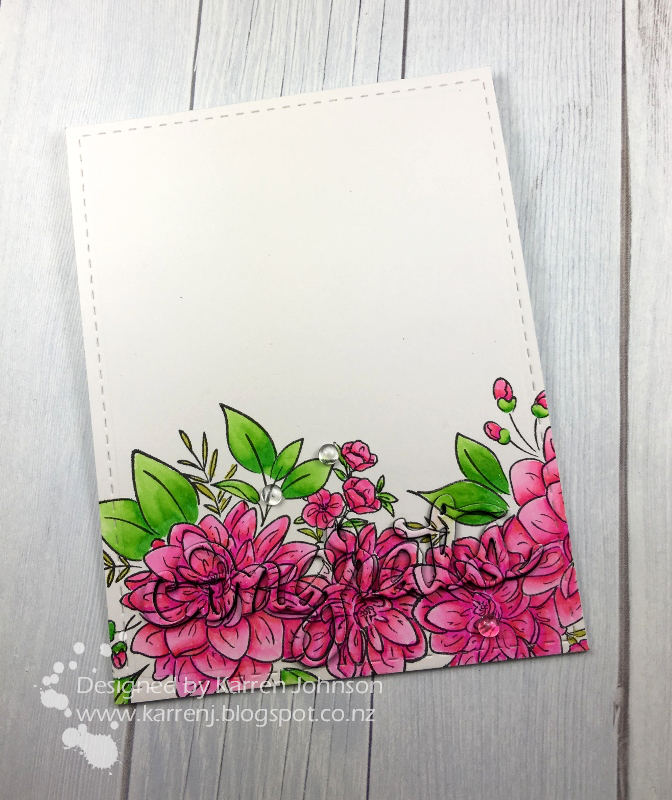 This week's sketch from the Freshly Made Sketches team comes to us from the lovely Amy O'Neill and she has a fabulous sketch for us. I made a Mother's Day card for my mum and this is what I came up with. I did a bit of stenciling on the orange circle, and by a bit, I mean I used 8 separate stencils! Total overkill, but I was having fun. 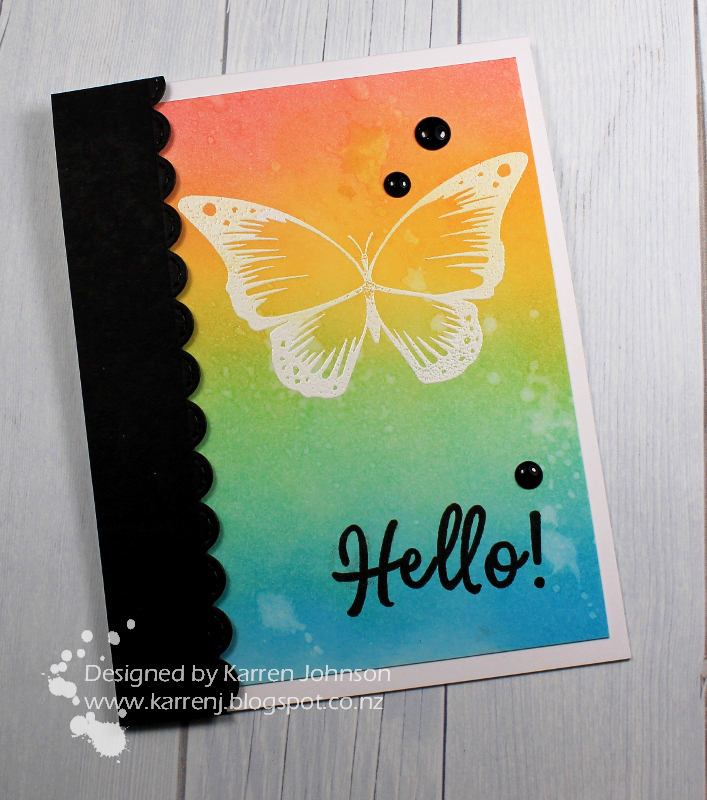 The butterfly was stamped then spritzed in shimmer mist and the sentiment comes from a Paper Smooches set. 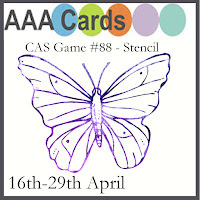 I'm linking this us to AAA Cards who have a stencil challenge going on. Thanks for visiting! 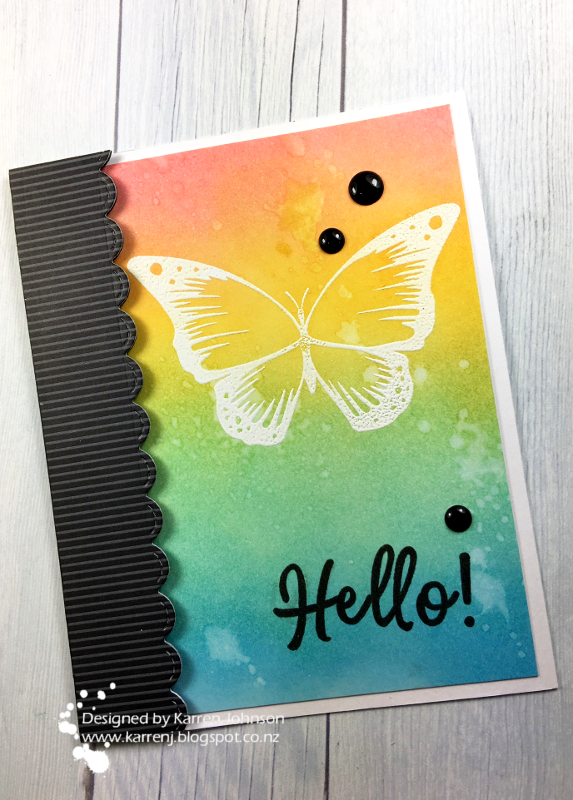 Head on over to the challenge blog and check out the fabulous creations made by the rest of the DT. Anzac Day /ˈænzæk/ is a national day of remembrance in Australia and New Zealand that broadly commemorates all Australians and New Zealanders "who served and died in all wars, conflicts, and peacekeeping operations" and "the contribution and suffering of all those who have served". 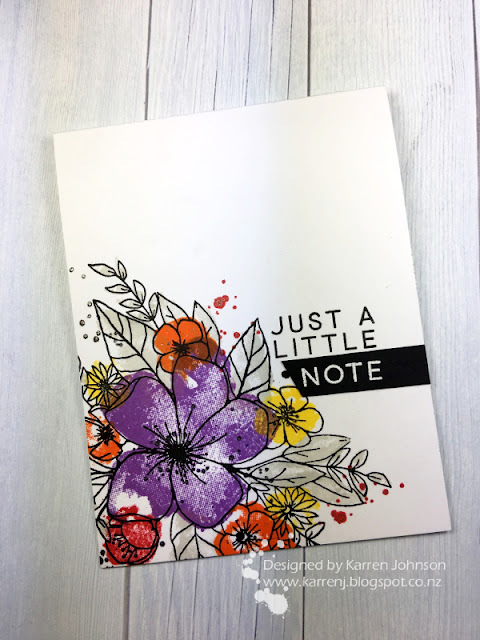 I made this card using the CAS theme at Always Fun Challenges and the graffiti theme at Inkspirational. I did think I was using the sketch at Paper Players, until I started writing this post and realised I forgot the strips at the side, so I'm not going to link up there, but do want to give them credit. This wasn't the direction I was planning on going with the graffiti theme. 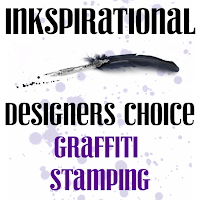 I was going to use another set and create a more realistic graffiti wall, but I came across this stamp set and decided it would be great for my youngest's upcoming 15th birthday, as he is an avid gamer. I chose a number of sentiments from the Level Up set, cutting them up where necessary, and stamped the background using Fog ink. I then die-cut with a stitched rectangle die and set it aside while I worked on the rest of the elements. The game controller was die-cut from various SSS cardstocks and assembled and the sentiment was white embossed onto Audrey Blue cardstock and then die-cut. 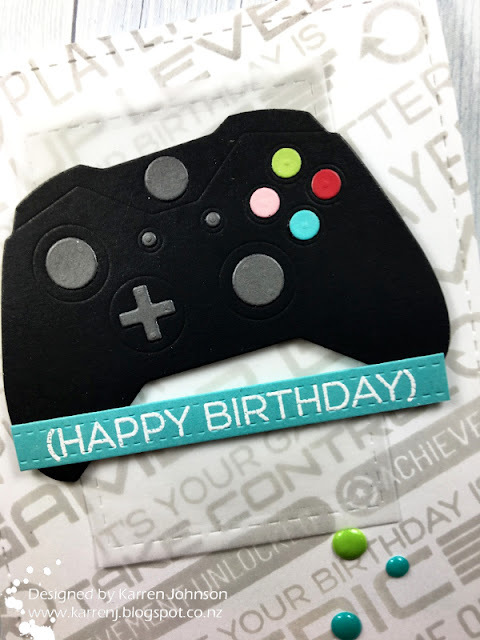 To assemble the card, I took a stitched vellum paper rectangle and adhered the controller and sentiment onto that using foam tape. I then added liquid glue to the vellum piece and glued that to the stamped panel. I finished with some Nuvo Crystal Drops. Hi! Thanks for popping in for a visit! 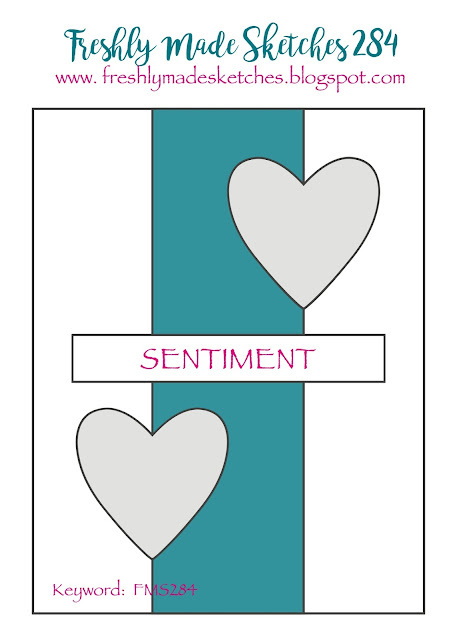 Today's card is one I made last week, but I'm just not sure about it. I used the gorgeous colors from Color Throwdown and this is the first time I've used the main floral image from the Hello Lovely set. 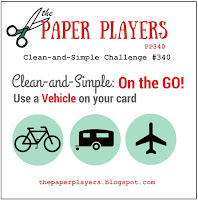 I'm also linking this up to Work It Wednesday and Simon Says Stamp's Wednesday Challenge. Anyways, I used the challenge colors for all the flower colors, keeping the red to a minimum. As there was no green in the challenge, I used grey for the leaves, which does help to tone down the brightness somewhat. I also added some red splatters to bring in a bit more red, then over all the splatters I colored with my new Atyou Spica pens in each respective color. Hi! I've made a few cards over the last week but have been a bit slack at posting them. Need to get a move on before the various challenges finish. I kept the blue tones and the thinking of you elements of Jenni's card, but used a cover plate die over an ink-blended bakcground. The sentiment is die-cut from black and then painted with clear sparkle pen. I finished with some jewel drops. Hi and welcome! 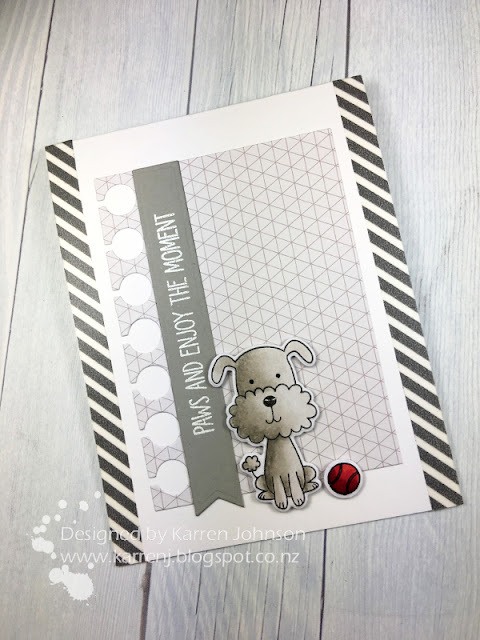 I made today's card using the sketch at MFT and a NBUS set called Four-Legged Friends. I colored the adorable pup with Copics and cut him out with the corresponding die. I then took the ball image from Lucky Dog and colored and cut that also. 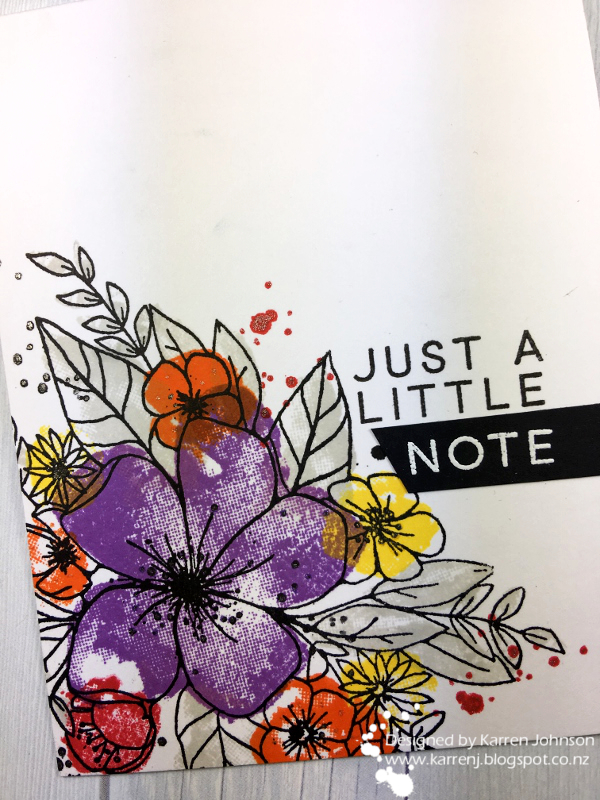 I used two strips of grey striped washi down each side of the card base, then die-cut a piece of patterned paper with a paper die. 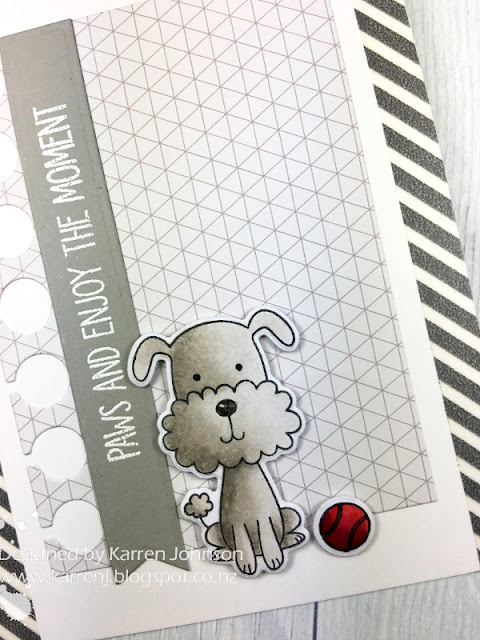 The sentiment was white embossed onto a Smoke flag shape and the card was assembled and finally I added some glossy accents to his nose. 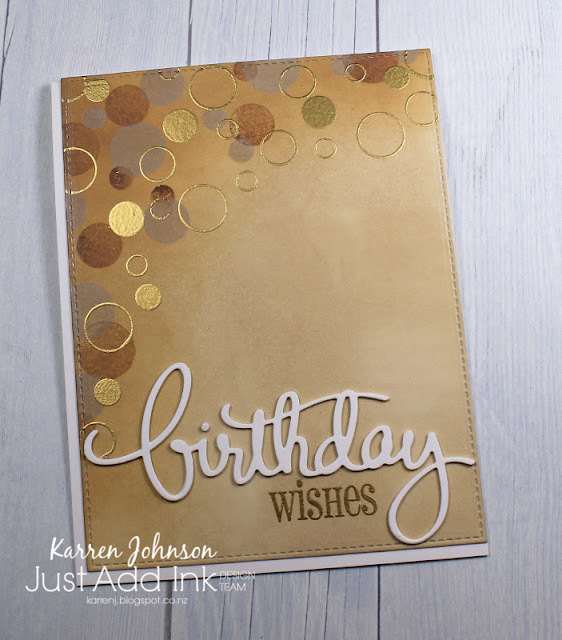 The team at Just Add Ink have come up with another fun Just Choose Two challenge and this week you get to choose from metallics, circles and balloons. I went with metallics and circles and came up with this card, which I made for my father's 84th birthday which was the other day. 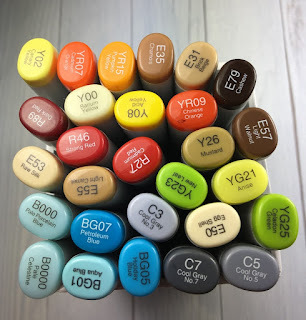 I had to wait a couple of weeks because I needed to order a pigment ink pad to sponge on the base color and then over-stamp with the circles. I bought Brown Sugar by Mama Elephant and I think it worked really well. 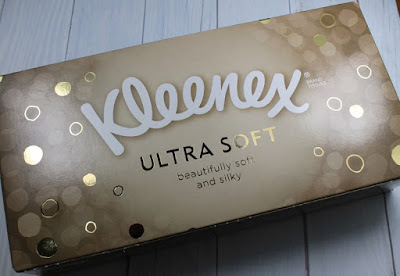 As well as the Brown Sugar ink, I also used Vintage Photo Distress Oxide ink, stamped off. 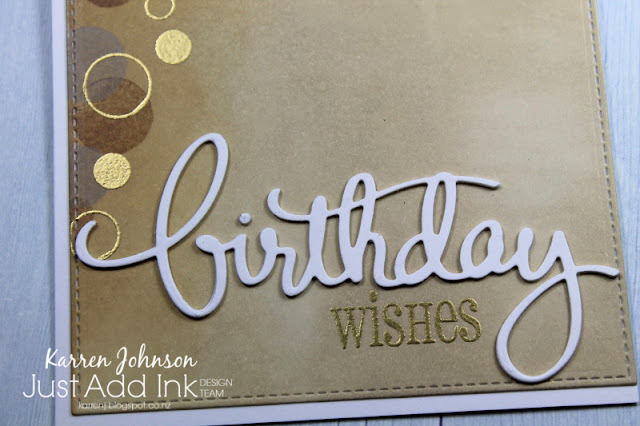 Once I'd sponged the Brown Sugar ink onto some Bristol Smooth cardstock, I overstamped with various sized solid circle stamps by SSS in both the Brown Sugar and Vintage Photo inks. Once the panel was dry, I gold embossed more solid circles as well as some outline ones, before die-cutting the panel with a stitched edge die. In keeping with the inspiration, I wanted a big, white sentiment so chose this Mama Elephant birthday word and paired it with a Clearly Besotted stamp that I had to perform some surgery on. Finally, and for something a bit different, I adhered it to the top-right hand corner of a white card base. I am so pleased at how this card came out and I hope my dad will like it. Thanks so much for visiting! The rest of the design team have come up with some wonderful cards using this challenge, so head on over and check them out. Hi and welcome! It's my turn to host at Freshly Made Sketches this week and I came up with a sketch that you can interpret in a few different ways. I chose to use some hot air balloons and some partial die-cutting for my card. 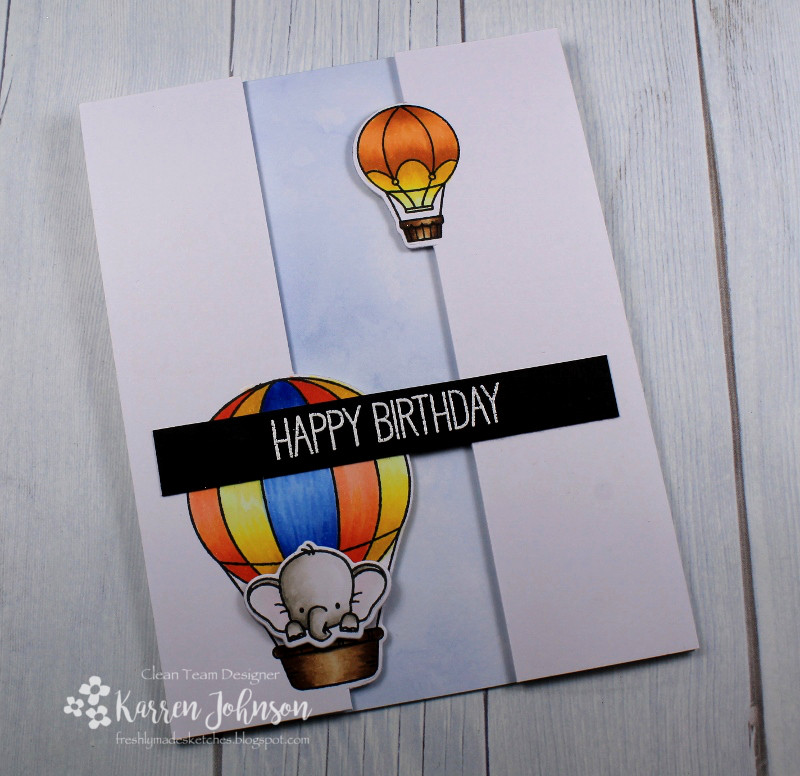 I marked out on a panel of X-Press It cardstock where I wanted my two balloons to be and stamped them using my Misti. 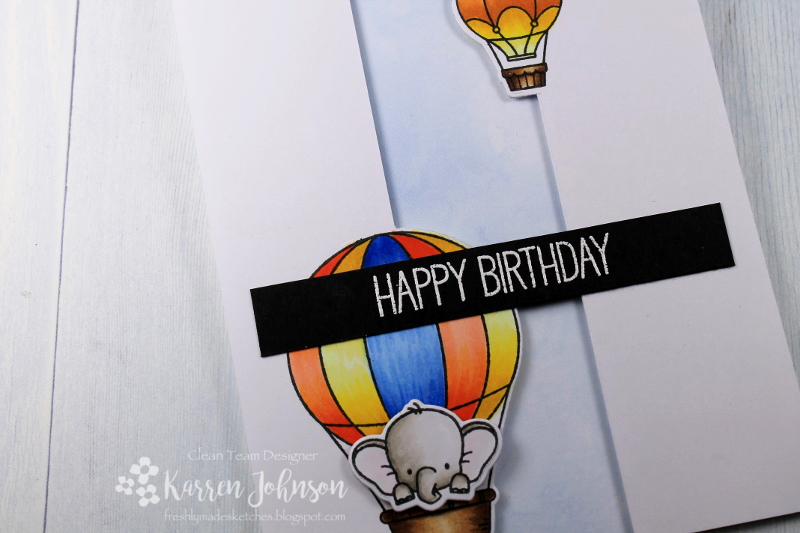 After coloring with Copics, I did some partial die-cutting to cut around one half of each balloon and then used my craft knife to cut the straight lines. That gave me two separate panels and a center panel, which I discarded. Onto a white card base, I adhered a piece of pale blue Watercolor Wash patterned paper then popped up the two balloon panels with foam tape. 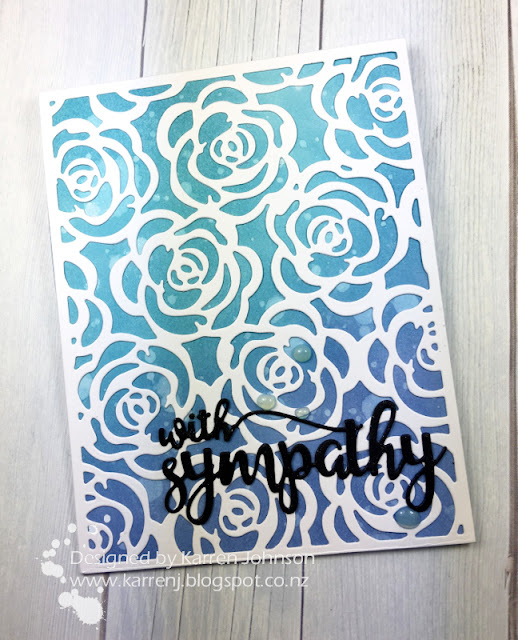 The sentiment was white-embossed onto black and adhered with liquid glue across the center. I created a video showing the process which you can view below or over on YouTube. Thanks for visiting. 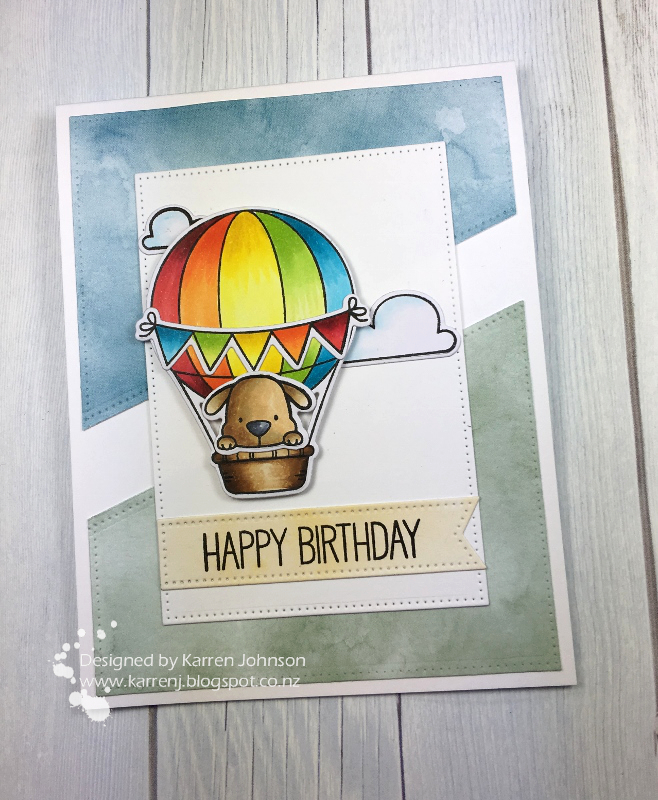 Be sure to check out the fabulous cards created by the rest of the design team and I hope you'll give my sketch a go. I'm linking this card up to MFT's color challenge as well. Hi and welcome! I'm at the beginning of a week off work (yay!) 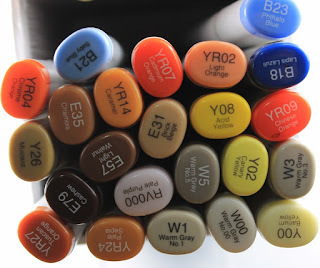 and plan on spending a lot of that time crafting, trying to catch up on online Copic classes and trying a few new techniques. The perfect holiday! 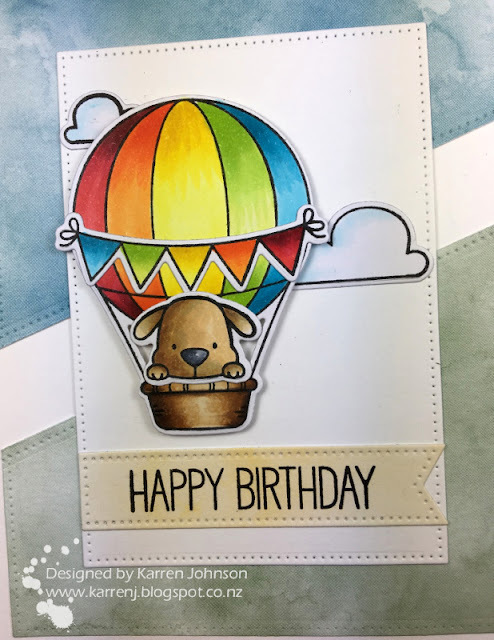 I made this card late last night using the current sketch at MFT, the Use a Vehicle theme at Paper Players and the Make Your Mark challenge at Addicted to Stamps and More. 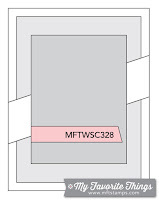 I used Blueprints 18 to cut the angled panels, then went over the die-cuts with Blueprints 21 and a Basic Stitch Line die to add the piercing. I chose blue Watercolor Wash paper to represent the sky and green for the ground and I used the pale lemon color for the sentiment. 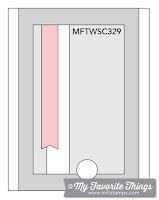 The images were stamped, colored with Copics and die-cut before being adhered to a die-cut rectangle panel. The balloon and dog were popped up on foam tape. 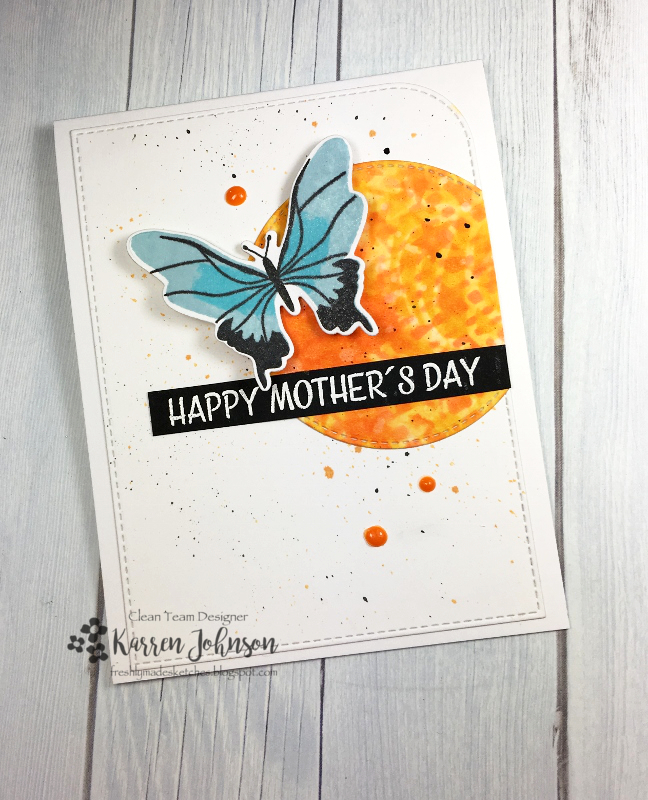 Edited to Add: This card got a shout out at Addicted to Stamps & More. Hi! I've had some fun just playing in my craft room today and made a card using the sketch from CAS(E) This Sketch, the pink and green theme at CAS Watercolour and the inlaid die-cutting theme from CAS Mix Up, where I used stamping, inlaid die-cutting and watercoloring. 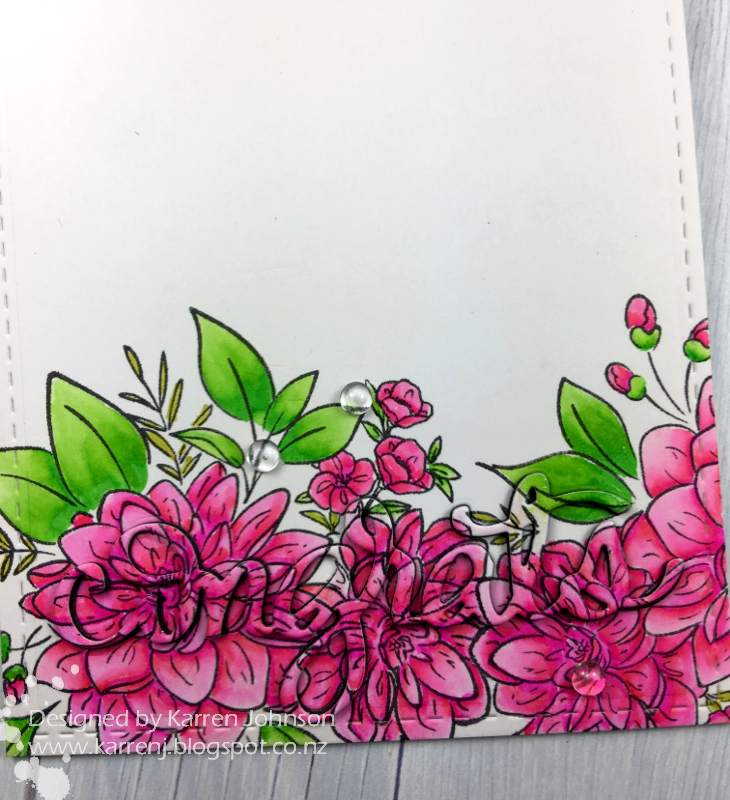 To make this card, I stamped the WP9 dahlia stamp in the bottom right of a panel of Bristol Smooth cardstock, added a mask then turned it around and stamped again in the opposite corner. After removing the mask, I colored the images with Zig markers, using 3 different pink shades and 3 different green shades. 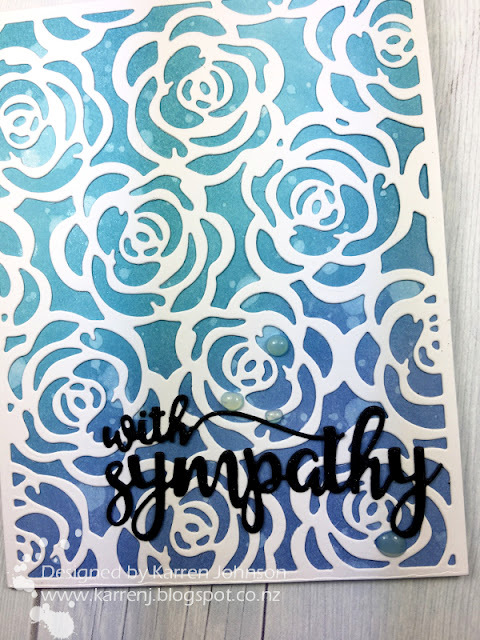 Once it was dry, I die-cut the panel with a stitched edge rectangle die and die-cut the congrats word from right through the center of the floral image. I set aside all the pieces and die-cut the word another 4 times from black cardstock, stacking each one on top of the other using spray adhesive. I then popped the stacked dies back into the gap left and then put back all the little center pieces of the letters. Finally, I adhered the floral die-cut word to the top, colored it with clear sparkle pen, added some clear droplets and called it done! 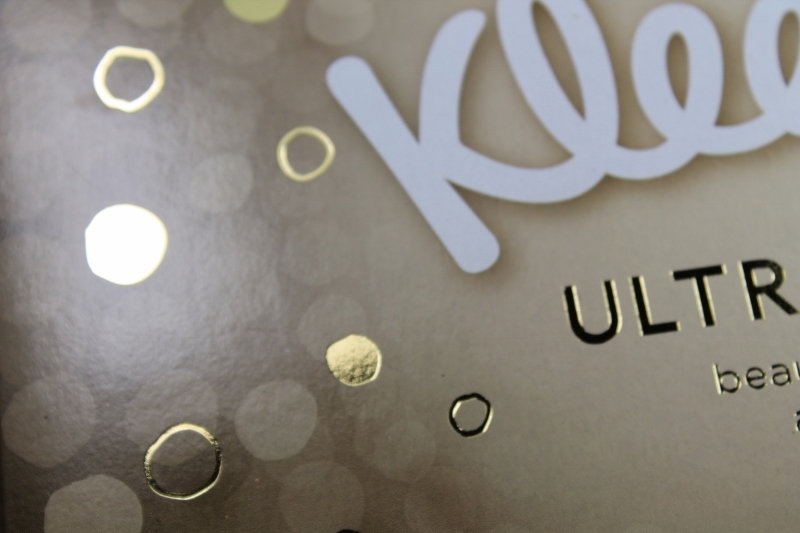 You can see the camouflaged die-cut word better in the next photo. 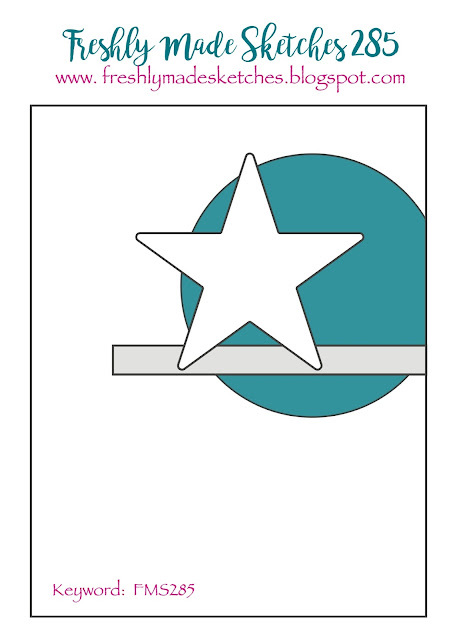 Edited to Add: This card got a shout out at CAS(E) This Sketch. Hi! I'm playing along with the current Muse challenge - a challenge I haven't had a chance to play with for such a long time. From Tracey's gorgeous card, I used the same images and bright colors but flipped it around so that the images were white-embossed and the colors were sponged on. I did the same with the sentiment - instead of being black on white, I went white on black. 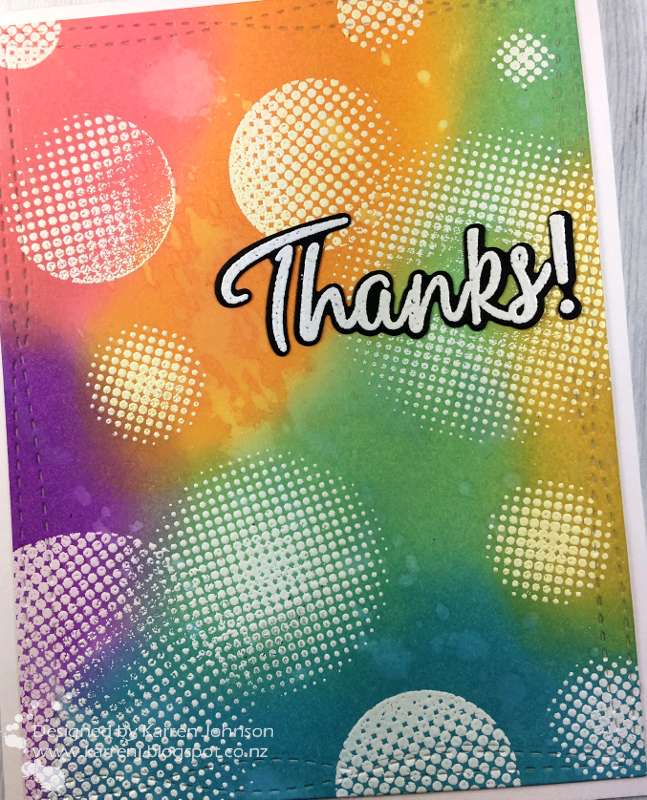 To make this card, I white-embossed the halftone circles onto a panel of Bristol Smooth cardstock, then blended Distress Oxide inks over the top. 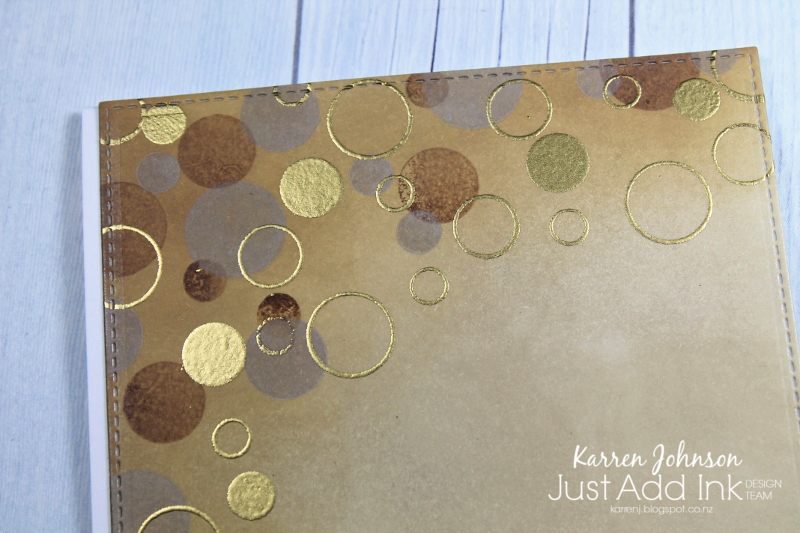 Some of the circles didn't stamp fully, but I quite liked the imperfect look, so left them as they were. I flicked on some water, mopped up the excess, then sponged over the top again to tone down the color variations. I die-cut the panel with a wonky stitched rectangle die and mounted it onto a white card base. The sentiment was white-embossed onto black and die-cut using the co-ordinating die. Thanks for visiting! Here's a look at the Muse card for this week.